The Society shall be called the "Paediatric Pathology Society". The aims of the Society shall be to promote expertise and research in paediatric pathology in its widest sense, embracing all disciplines having a relevant connection to paediatric pathology. Any member of the Society may propose a new member and the proposal must be seconded by a member from a different centre. Applications for membership should be accompanied by a curriculum vitae and a list of publications the candidate may have. All applications for membership must be scrutinised by the Committee. If approved, the names shall be submitted verbally to the Annual General Meeting and be subject to election at the meeting. The Committee may grant part or full exemption from subscription fees to individuals working in economically disadvantaged countries. Full members may also be granted subscription to the Journal paid for by the Society. The number of exemptions and granted Journal subscriptions shall be set by the Committee at its Annual meeting on the advice of the Treasurer. Granted Journal subscriptions shall be reviewed every 3 years and may be revoked dependent upon available funds and new applications. Preference shall be given to groups of pathologists willing to circulate the Journal amongst them. Application for reduction or exemption from subscription fees or granted Journal subscription should be made to the Honorary Secretary in advance of the Annual Meeting. The number of supported memberships and journals shall be reported to the Annual General meeting, however, the details of the individuals receiving support shall be confidential. a) Full Membership: Consultant grade or equivalent pathologists who spend more than 50% of their time in paediatric or perinatal pathology are required to become Full members of the Society. Full membership is also open to consultants who spend part (<50%) of their time in paediatric or perinatal pathology and to specialists in allied disciplines and scientists working in relevant fields. Individuals pay a full subscription and have full rights to vote and hold all grades of office in the Society, and submit and/or sponsor abstracts for presentation at scientific meetings of the Society. Full members are obliged to subscribe to the journal if they are resident in Europe. Full members resident elsewhere may subscribe to the journal through another IPPA Affiliated Society (e.g. SPP, ANZPPG, SLAPPE and JPPS). b) Associate Membership: Consultant pathologists who spend less than 50% of their time in paediatric pathology and individuals who are not paediatric pathologists but whose work is very closely associated with our discipline (e.g. developmental biology, genetics, oncology, biochemistry, paediatrics, epidemiology etc) may opt to take Associate Membership. Associate members pay a reduced subscription. They have the right to vote and sit on committees without the right to hold executive office (President, Secretary or Treasurer). They may be consulted for their views on issues, receive the Newsletter and other correspondence and may attend meetings without having to be sponsored. Subscription to the Journal is optional. c) Junior Membership: Individuals who are in training to become paediatric pathologists are eligible for this category of membership. Junior membership shall be limited to the period of training. They pay a reduced subscription but have no voting rights or right to hold any form of office. They may be consulted for their views on issues, receive the Newsletter and other correspondence and may attend meetings without having to be sponsored. As with Associate membership, subscription to the Journal is optional. d) Emeritus Membership: Regular or Associate Members who have fully retired may request that the Secretary transfer them to emeritus status. They may submit and/or sponsor abstracts for presentation at scientific meetings of the Society. They are not eligible to vote, hold office or serve on committees. They shall be entitled to receive all correspondence and the Newsletter indefinitely. They may take the journal at the reduced Society rate. e) Honorary Membership: Honorary membership of the Society may be given to individuals who have made a significant contribution to Paediatric Pathology, particularly at an international level. An Honorary Member is granted free membership of the Society. They do not have the right to vote or hold executive office, but can be co-opted as non voting members of the Committee. They may submit and/or sponsor abstracts for presentation at scientific meetings of the Society. They may also sponsor or second new members to the meeting. They may receive all correspondence and the newsletter. They may obtain a subscription to the journal at the reduced Society rate. Honorary members shall be nominated by the Committee for election at the Annual General Meeting. Such nominations shall be included in the agenda for that meeting. There shall be a Committee consisting of the President, President-Elect or Past President, Secretary, Treasurer, Membership Secretary and 6 members elected at the Annual General Meeting. The Chair of the Paediatric Pathology Working Group of the European Society of Pathology will also be a member. 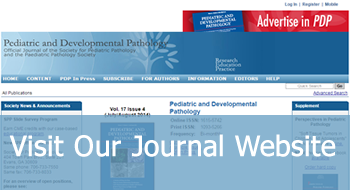 The PPS associate editor of 'Pediatric and Developmental Pathology' will be a Committee member ex-officio. The Committee should, as far as possible, be representative of the main branches of paediatric pathology and of the geographical membership of the society and shall have power to co-opt. The Committee shall fill in casual vacancies by co-option. The Committee shall have power to act on behalf of the Society and shall report its activities at each Annual General Meeting. The Committee shall meet as often as necessary: at meetings of the Committee a quorum shall consist of 5 members, of whom only one may be a co-opted member. In the event of a tied vote, the President or Acting Chairman will have a casting vote. The President shall be chairman of all meetings of the Society and the Committee. In the absence of the President, the President-Elect or Past President shall act as Chairman, unless they are both absent, in which case the Committee shall elect a Chairman from among the members present. The President's tenure of office shall be 2 years. He/she shall be responsible for establishing and strengthening contacts with other Societies of Pathology and Paediatrics and shall be elected (as President-Elect) to the Committee 1 year before taking office. The President will remain on the Committee for 1 year following his / her tenure of Office in the capacity of Past President. The term of office for the other members of the Committee shall be 3 years with the possibility of immediate re-election for the Secretary, Membership Secretary and the Treasurer. The Secretary shall be responsible for communication with members of the Society in addition to other duties usually pertaining to that office, including preparing the PPS Newsletter, communication with the Local Organiser of forthcoming Annual Meetings, communication with the PPS webmaster. The Treasurer shall be responsible for managing the financial affairs of the society, including maintaining the accounts and all receipts and disbursements. There shall be a Membership Secretary, who shall be responsible for maintaining a database of members' details and processing applications for membership prior to the Annual Meeting. The Membership Secretary shall be elected by the Annual General Meeting, for a term of 3 years. Education - the education subcommittee shall be responsible for organising the educational and scientific contents of the Annual Meetings and awarding prizes. The responsibilities of this sub-committee should be to review abstracts submitted to the annual meeting and to prepare the accepted abstracts for publication. The committee should consist of at least 2 members of the main Committee plus up to 2 additional members. Nomination - The nominating committee should comprise three members appointed by the President among regular Committee members. The President will decide who shall be the chairman of this committee. Their tenure of office shall be two years. Their mandate is to nominate Officers and Committee members. Suggestions from Society Members must be sent to the nominating committee three months before the annual meeting. Prospective nominees must be consulted regarding their willingness to serve prior to announcement of candidacy. The Society will meet at least once a year and hold a scientific and business meeting, including reports by the President, the Secretary and the Treasurer. Voting at meetings of the Society and its Committee will be on a simple majority basis and will be conducted by the chairman of the meeting. The President will have a casting vote. Normally this will take place at the Annual General Meeting. The Secretary shall send to each Society member, not less than three weeks before the Annual General Meeting, an agenda including the names of candidates for election as President, President-Elect, Secretary, Treasurer, Membership Secretary and Committee members, along with the names of existing and retiring officers and Committee members. Nominations, with the written consent of the nominee, must be received by the Secretary six weeks before the Annual General Meeting. There shall be an annual subscription fixed by the Committee with the approval of the Annual General Meeting. Resignation of a member shall be valid only if submitted in writing to the Secretary. Such resignation shall not relieve the member's responsibility for any amount due to the Society. Failure to pay annual dues for a period of two consecutive years shall cause forfeiture of membership. The Secretary shall notify the member of this impending action in writing. Membership may be reinstated upon payment of dues or reapplication for membership. The rules of the Society may be amended by a simple majority of the Annual General Meeting provided that the proposed amendment has been published in the agenda circulated to the members of the Society. No amendment shall be made which would cause the Society to cease to be a charity at law. Should it be decided to dissolve the Society, any assets remaining after satisfaction of all debts and liabilities shall not be distributed amongst the members of the Society, but should be given to some charitable institution or institutions having objects similar to the objects of the Society and if, and so far as, effect cannot be given to such provision, than to some charitable object.. This Constitution had been approved and adopted at the Annual General Meeting, 18 September 1998. Sections 3.1 and 3.2 were amended at the Annual General Meeting, 23 April 2004. Section 3.2 was amended following the Annual General Meeting 1st September 2005. Section 3.1e was added at the Annual General Meeting, 5th September 2008. Sections 2, 3.1c, 3.1e, 3.2 and 3.3 were amended at the Annual General Meeting in Madrid, October 26th 2012.
was approved and adopted at the Annual General Meeting, 18 September 1998. Sections 3.1 and 3.2 were amended at the Annual General Meeting, 23 April 2004. Section 3.2 was amended following the Annual General Meeting 1st September 2005. Section 3.1e was added at the Annual General Meeting, 5th September 2008. Sections 2, 3.1a, 3.1c, 3.2 and 3.3 were amended at the Annual General Meeting, 17 September 2010. Sections 2, 3.1c, 3.1e, 3.2 and 3.3 were amended at the Annual General Meeting in Madrid, October 26th 2012. Sections 3.1d, 3.1e, 3.2, 3.3 and 3.5 were amended at the Annual General Meeting in Lisbon, 8th September 2017. Useful links to other Organisations.